Our Goshen Pest Control Exterminator will identify the source of the pest infestation and create a customized treatment plan to eliminate the pests. 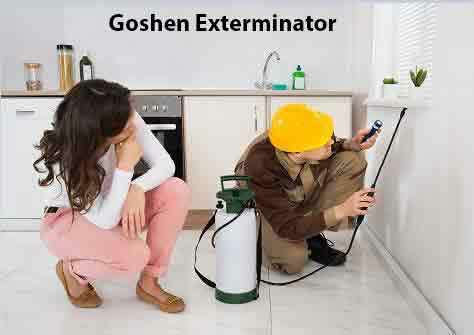 Let us be your Goshen Exterminator, Give Us A Call Today. 1-844-305-8999. Most commonly referred to as Creepy Crawlers their actual name is the house centipede. Centipedes can bite and are poisonous. The poison from their fangs, located behind the head, is used to kill insects, Although House Centipedes are good to have around as they feed on bed bugs, termites, cockroaches, silverfish, ants and other unwanted pests, you don’t want a Centipede Infestation as your Exterminator. If you notice you have Centipedes or any other unwanted pests, Give our Goshen Exterminator A Call Today. Brown Marmorated Stink Bugs are native to Asia and were accidentally imported to the Allentown, Pennsylvania in 1998. By 2007 they made their way into New York. The brown marmorated stink bug is more likely to invade homes in the fall. The Stink Bug survives the winter as an adult by entering homes and structures when autumn evenings become colder, often in the thousands. If you notice you have Stink Bugs on your property or in your home and would like them removed. Give Us A Call Today. Carpet Beetles are sometimes confused with bed bugs. There are two main groups of Carpet Beetles in the Goshen New York area. These include the Black Carpet Beetle and Furniture Carpet Beetles. The Varied Carpet Beetle is a 3 mm-long beetle, they are a common species, often considered a pest of domestic houses and, particularly homes with carpet where the larvae may damage natural fibers and will damage carpets, furniture and clothing. Let our Goshen Exterminator eliminate your Carpet Beetle Infestation. Call Us Today.